The Borgward BX7 belongs to the large mid-size SUV market, which is popular all around the world, and impresses with its confident appearance and innovative technology. *Data for the Asian market, market-related changes possible up until market launch! Sophisticated design, dynamically athletic and a confident presence are what characterise the Borgward BX7’s appearance. Outstanding design features are the OCTAGON grille with the legendary brand diamond and the side wing lines. Both are part of the Borgward design DNA, which follows the “Progressive Heritage” guiding principle. Besides its assertive appearance, the BX7 body impresses with several comfort features, such as the electrically operated boot lid or the large glass roof that extends over the second row of seats. 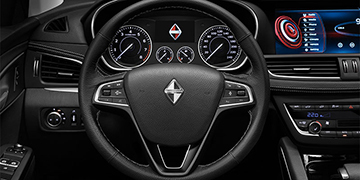 The Borgward BX7’s interior design and features impress on a level that normally only goes without saying with significantly higher and more expensive premium car classes. The interior also takes the “Progressive Heritage” guiding principle and combines traditional car manufacturing with state-of-the-art technology into a luxurious feel-good ambience. The poles between natural materials like the leather upholstery with classic Borgward diamond quilting and innovative components such as the central 12.3 inch media touchscreen are particularly impressive. In addition, harmonious colour schemes combined with the immaculate craftsmanship finish accentuate the luxury setting where occupants instantly feel at home. The Borgward BX7 can be configured with five, six or seven seats depending on your personal preferences. Intuitive user friendliness, state-of-the-art infotainment, a high degree of networking with Internet access and extensive online services are all integral components of the Borgward brand philosophy. 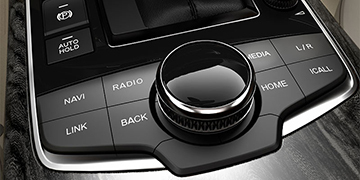 The Borgward Connect Intelligent Connectivity System offers a high level of user friendliness in the BX7. Depending on their preferences, the driver has the choice whether they want to access and operate the infotainment menus using the direct access buttons, turn and press controls positioned in the centre console or the 12.3 inch touchscreen. The central 12.3 inch touchscreen can be operated like a smartphone display using different finger gestures and some of it can be freely programmed. The driver can arrange the panels to suit their preferences. The control panel with turn and press controls and eight direct access buttons makes the infotainment system incredibly easy to use. The photo realistic colour display positioned centrally in the cockpit reliably informs you about the BX7’s operating condition and is controlled using different buttons or rollers on the ergonomically designed steering wheel. With its comprehensive “B-Safe” safety concept the Borgward BX7 meets all the requirements with regards to maximum safety for its occupants. Active safety features can preventively identify potential hazards and therefore help avoid accidents. The vehicle structure and restraint systems also give the SUV the potential to pass international crash tests and safety ratings with flying colours. The body with its highly stable passenger cell and defined deformable barriers at the front and rear is the reliable foundation for superb occupant protection. Crucial body sections are reinforced with high-strength, ultra high-strength or hot-rolled steel. Should, however, the worst come to the worst, several load paths distribute the impact energy in the event of a head-on, side or rear crash and therefore ensure that the deceleration values that are configured exactly to the passive safety equipment are as balanced as possible. The passive safety equipment unfolds its maximum protection potential. For the different kinds of crashes, such as head-on, side or rear collisions, alongside the belt systems there are also up to six air bags provided, which are activated as required depending on the severity of the accident and can dramatically mitigate the consequences of an accident on the occupants. These include two-stage hybrid air bags for the driver and front passenger, side air bags for the driver and front passenger and the curtain air bag. So that the passive safety equipment remains as inactive as possible, the Borgward BX7 offers several preventive driver assistance systems that can prevent accidents as part of the “B-Safe” concept. These include, for example, the blind spot alert, road sign assistant or fatigue alert. Systems such as the 360° dome camera also make handling the Borgward SUV even more comfortable particularly in confusing situations and help prevent minor damage. Parallel and diagonal parking manoeuvres are no problem at all and drivers can complete tight shunting manoeuvres in a narrow car park or in confusing terrain to the centimetre. And Borgward drivers don’t need to take narrow exits blind as the front and rear camera makes crossing pedestrians, cyclists and cars visible on the central display.